THE Royal Navy’s first aircraft carrier is set to return to the United States later this year. HMS Queen Elizabeth’s official twitter account hinted at a second visit across the pond in 2019 in a recent social media post. They tweeted: ‘Banish the January blues; we are one month closer to #Westlant19 2019 will see us further, safely, tailor @thef35 to 4.5-acres of Sovereign Power along with expanding the capability of our Ship and crew. And after being contacted by The News, the Royal Navy confirmed that HMS Queen Elizabeth will be returning to the USA for operational testing with F-35 jets, following on from the developmental tests conducted last year. The aircraft carrier left Portsmouth in August 2018 and sailed to America for Westlant 18, returning in December just in time for the crew to celebrate Christmas with their families. With the historic flight tests seeing F-35 jets land on her decks for the first time. The confirmation of this future deployment to the USA, follows the Defence Secretary Gavin Williamson’s announcement that HMS Queen Elizabeth will be sent to Pacific on her first operational mission. 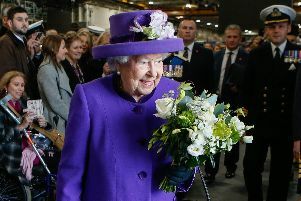 Accompanied by a complement of UK and US F-35B stealth jets, Portsmouth-based Queen Elizabeth will also visit the Mediterranean and Middle East in 2021. Mr Williamson said the nation must be prepared to take military action against countries that ‘flout international law' or risk being seen as a ‘paper tiger’. As part of the defence revamp, the UK is looking at plans to invest in a new class of assault ships capable of transporting Royal Marines and special forces into battle. Known as littoral strike ships, the vessels would operate as a platform to deploy amphibious troops, working as part of a new strike group. Two would be built and forward-deployed, with one based to the east of Suez in the Indo-Pacific and one to the west of Suez in the Mediterranean, Atlantic and Baltic. The vessels can carry everything from helicopters and fast boats to underwater automated vehicles and huge numbers of troops and able to sail close to land. ‘These globally deployable, multi-role vessels would be able to conduct a wide range of operations from crisis support to war fighting,’ Mr Williamson said.